Hypnosis Coaching – What Is It? Today, I’d like to explain what hypnosis coaching is. 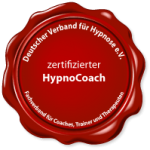 “Hypnocoach” is a professional title specific to Germany, where I live and work. In Germany, a Hypnocoach or hypnosis coach is someone who is trained in hypnosis, but does not have additional medical or psychological qualifications (“Heilerlaubnis”). Additional training in medicine or psychology would legally qualify this person to also treat named illnesses, such as cancer, diabetes and arthrosis. Although the 150 hours of clinical and analytical hypnotherapy training I’ve done is very intensive, detailed, practical and much, much longer than most other training courses in the world, I may not call myself a hypnotherapist while I am living and working in Germany. I could do an additional exam to become an alternative practitioner (“Heilpraktiker”), allowing me to call myself a hypnotherapist and help clients with named psychological conditions too. But at the moment, I choose not to because there are so many ways I can help my clients already! In short, there is no fundamental difference between the methods of hypnosis coaching and hypnotherapy, but a hypnosis coach is not allowed treat clients for known medical conditions using hypnosis. The training I’ve had is in the original Transforming Therapy™, an amazing short-term and result-oriented therapy developed by Gil Boyne between the 1960s and 1990s. He trained my eminent teacher and therapist Dr John Butler and worked closely with him for many years. By the way, Gil also trained the famous UK hypnotherapist Marisa Peer at his school in California in the 1980s. Hypnosis Coaching – What’s It For? I use my hypnotherapy skills to help people transform their energy from subconsciously focussing on failure, frustration and unhappiness into experiencing real success, clarity and contentment. You see, we all have the power within us to change our energy, but some of us haven’t learnt how to do this yet. Usually, I can see what each client needs within the first few minutes of talking with her. And, for the record, we never “get rid of” an unwanted habit or behaviour, we replace them with new, positive and beneficial ones. That’s what changing your energy means. Hypnosis with this method helps you to become a “whole” person – integrated, healthy, creative, successful and happy! If you would like me to help you change your energy in a more positive direction, please choose an appointment for a free 15-minute initial contact call here.